As a virtualization-centric blog, I have to do my required postings about my home lab equipment. If you are studying for any of your certifications in either VMware or Microsoft, or do much technical support at all, you will eventually start working with virtualization in one form or another. Once you start using virtualization, you really hate to be without it! Most home lab hardware comes in three varieties, Host based virtualization running on your desktop or laptop, home built White Box servers, or used Enterprise grade server hardware. Because I have a very understanding wife, I have all three levels of home lab hardware and I will go over each of them in an upcoming series of posts. All of these can be addressed with careful planning and patient shopping. If you are flush with cash, you can spring for the latest and greatest hardware. If not, you can assemble serviceable equipment from slightly older parts that are still more than adequate for learning on! Recently I bought a used Iomega IX4-200D from eBay at a very good price. There is always a bit of risk buying used electronics, but this had a seven day return policy, so I gave it a thorough once-over. It seemed a little slow so I flashed it with the latest firmware, and everything checks out good. I imagine the it’s slowness was why the unit was returned. But the previous owner just shipped the unit back, still with 12 gigs of his data on it. It looks like he used it for his Architecture business; there were plans, clientele lists, invoices, family pictures, the whole nine yards on it. People really, really need to be aware of stuff like this, especially when you have personal data of other people!! When I disposed of drives at work, I had some old servers in a rack for various drive types. I would load them up, boot from a DBAN CD, and walk off while they did their thing. The drives were later tossed in a gondola for a trip to the metal chipper. If your hardware is leaving your control, you owe it to yourself (and others) to at least attempt to remove the data. You just don’t know where it is going to wind up. Hittin’ the (virtual) road to VMworld 2010! I am looking forward to actually meeting and putting a face to the tweets and blogs that I have followed for so long! I’ve got my netbook and my Droid X, and am ready to soak up the labs and sessions! On a recent project, I had to install ESXi onto an HP DL380 G6. This chassis is decidedly non-optical drive friendly, as previous chassis would allow you to just snap a DVD drive into it. The G6 now requires you to disassemble a fair portion of it to install a drive. I had 140 servers to do, so installing DVD drives wasn’t an option (plus it saved me $14,000 in my budget). 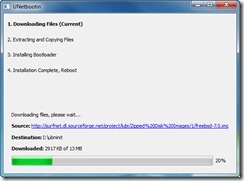 Download UNetbootin for Windows. I had used v3.77 originally, and it looks like it is up to v4.71 now. Run UNetbootin. Check off Distribution, and select FreeBSD from the dropdown. 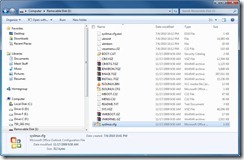 For version, select 7.0. Under Type, select USB Drive, and the current Drive letter of your USB drive. Click OK.
UNetbootin will them go out to Sourceforge.net and grab the needed files from the FreeBSD ISO. 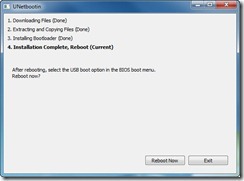 UNetbootin will then go about its business extracting the files and installing the Bootloader. Click Exit. 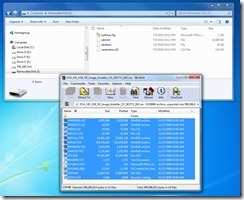 Now, copy the files from the ISO image onto the USB drive. I like to use WinRAR. Now, rename the original syslinux.cfg to something else, like syslinux.cfg.esxi, and make a copy of the ISOLINUX.CFG file as syslinux.cfg in its place. Plug in the drive, make sure the server is set to boot from USB, and away you go!